Knock the dragon off the bridge and optionally put him down for good in Dark Souls 3: The Ringed City. This Dark Souls 3: The Ringed City walkthrough chapter covers the short run from the Shared Grave bonfire back to Ringed Inner Wall. This is a pretty eventful section, even if geographically it is short. Along the way we’ll unlock an optional boss, open the shortcut gate right back to the Ringed Inner Wall, find the path to the optional boss and collect some sweet loot. Since this is a short chapter, we’ve also included a guide to beating the optional boss, Darkeater Midir, but be warned, dear cheeseburger assassins: this is a very, very tough boss, designed for the hardiest of players, and not glass-jawed little sneaksters like us. If the messages are anything to go by, this boss has broken many a player. Personally, I got someone else to do it, placing the control pad in the hands of a woman ten years younger who thinks nothing of lightning combos and split second dodges. I highly recommend this method, or if it is not available to you, try pretending the optional boss does not exist at all. From the Shared Grave bonfire, you end up face to face with the dragon again. 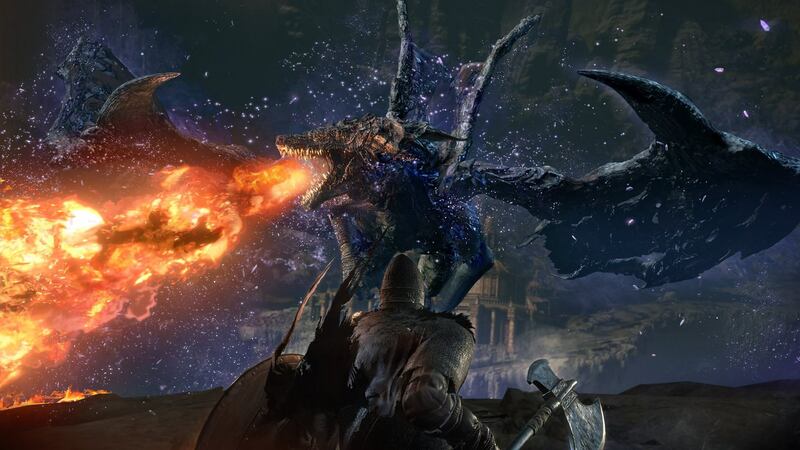 Darkeater Midir has two flame attacks here – a sweeping beam that travels from right to left (your orientation), and a straight blast that is aimed directly at you, wherever you are. The latter is far more deadly. This seems like a good spot for a cheese, but with feather arrows and a fully upgraded Black Bow of Pharis I was only getting about 35 damage per shot if I managed to bean it right on the nose, and at that rate even I lost patience. There’s a far better option just a little further on. Now, you can just run past Darkeater Midir, if you’re quick and time it well, but if you knock him off you clear this area for good, and open an optional boss fight with him, which, as we already mentioned, you should definitely ignore as it is awful in every way. It’s not too hard to knock him off, either. First, run forward hugging the left wall to climb up on the rocks a bit. There’s usually a message here advertising the safe zone. Give it a like while you’re there. This is the optimal place to cheese Midir, and it’s still a little tricky. The real danger is the straight line flame blast, because if he fires that while you’re lining up a shot, you are literal toast. Be ready to roll back into shelter if you see him preparing it: he’ll be looking right at you, rather than lifting his head, with flame around his face. He rarely does it twice in a row, but it does happen, so don’t get cocky in its wake. Use feather arrows and stick to one shot at a time unless Midir is roaring. Eventually he’ll fall down, and this is a great time to run up and finish him off with melee. If you’d rather duel the whole way, getting close to Midir is a bit trickier than to this first safe zone; as soon as the fire stops, move out onto the rocks where they’re not burning and see what Midir is doing. It’s only safe to advance while Midir is winding up for his sweeping fire blast (head thrown up); if he has his head pointed at you and is flaming, he’s about to fire his direct blast, which will hit you, and if he’s roaring, he may fire the direct blast before you reach him. Assuming Midir is winding up his sweeping blast, sprint forward and get behind the low rocks on the left as soon as the fire on the ground allows it. Then immediately run towards him and get in among his feet; the rocks nearby are not a safe zone if he goes for the direct blast again. When you reach Midir, get under his body and attack the claw that’s on the right (as you face him running up the path) for best results. Midir has a melee combo; he’ll stomp once with his left claw, and then sweep it along the ground horizontally. It’s pretty easy to avoid just by staying near the back edge of the cliff, near his body. He also has a flame attack, which can fill the area right by him, and he usually continues on from it with a beam attack, which traces the path of a devastating blast to follow. Again, if you’re at the right claw and close to the cliff edge both of these attacks will miss you. If not, it’s best to move along the path a bit rather than try to stay beneath him where it’s hard to see and dodge. For best results here, unlock the camera, two hand your weapon, and be very careful not to fall off the cliff yourself as you wail away on Midir. All you need to do is keep coming back to that same claw, dodging his stomp, and you’ll whittle him down in no time. Whether you cheese or duel the whole way, when Midir’s health bar is completely depleted he falls into the ravine and you are free to run about this area without fear of his flame attacks. Nice. 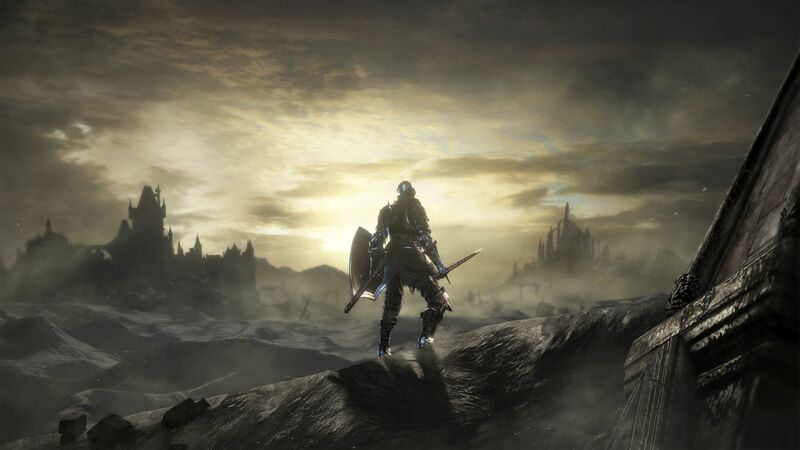 With Midir down, cross the bridge, grabbing the titanite scale on the way. Enter the building to find a seemingly empty room. Ignore the stairs for now and smack the wall next to them, revealing a humpbacked man. Kill it, then bash the next wall to find a large soul of a weary warrior. Bash yet another illusory wall to find the Lightning Arrow spell. Activate the nearby lift and open the gate you find at the bottom to find yourself back at the Ringed Inner Wall bonfire. 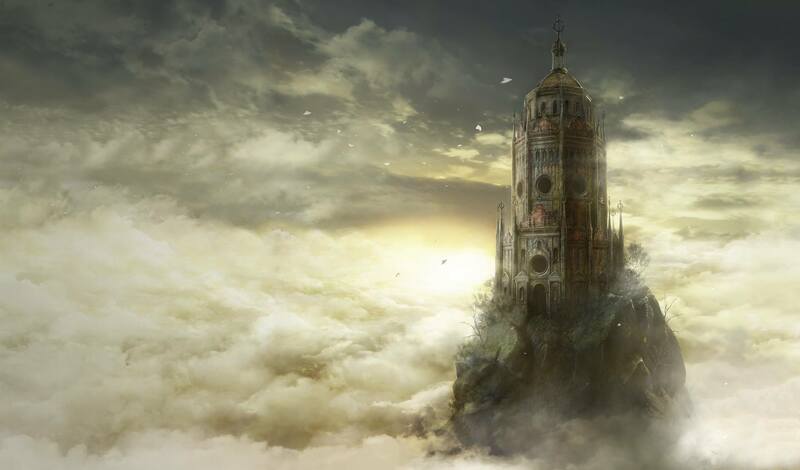 This is a good time to go back to the locked door at the top of the grand stairs between the Ringed Inner Wall and Ringed City Streets bonfires and have a chat with the NPC there, but it’s not necessary; you don’t get anything for it, although she gives you a clue about where to find the optional boss. We already know the answer so you don’t have to risk it. Although we’ve said you don’t need to fight Darkeater Midir, it’s worth going right up to the edge of his boss arena for some good loot, so follow along for a little while. From the Ringed Inner Wall bonfire, enter the lift room and activate it so it heads down. Immediately turn left and run into the wall, and you’ll stumble into a doorway part way down. The path here goes two ways. Turn right and head down, dropping through the broken floor, to land back with the Gwyn statue and take the Chloranthy Ring +3. Definitely worth the trip. Return via the lift and hidden door, and go the other way to find an ember. Attack the first statue clockwise of the item to open a hidden path. Go down the stairs to find a path ending at a ladder. You can very carefully edge around the left side to grab a Filinore’s Spear Ornament, a new covenant trade item, if you like. Otherwise, just descend the ladder. Bloodstains suggest many players find this action difficult, for some reason. In the room at the bottom you can collect the Antiquated Plain Garb and Violet Wrappings. If you’re in ember form and you haven’t seen the end of the DLC yet, you’ll also find a summon sign for the NPC phantom Shira. If you’re sensible, go back up the ladder and drop down through the hole above the Gwyn statue to go back to the bonfire and rest up for the next section of the game. Otherwise, read on. Adjust your build, summon and do whatever else you want to before dropping down the hole behind the altar to begin the Darkeater Midir boss fight. Like most dragons, Midir is weak against lightning – so think about that when choosing a weapon, consumables and spells. He is resistant to dark, as the name implies, so don’t bother with that. This is a fight best kept up close and personal. Midir has a number of area of effect and ranged attacks, and all but one of them are most easily avoided by sticking very close to him. The worst move in this fight is Midir’s flying flame breath, which is almost impossible to avoid entirely unless you’re right under his belly. If you see him take to the skies, get under him. If you’re unlucky enough to be far away when this happens, you’re in trouble – so bring the best fire resist armour and shield you have. Not that it is going to help much; you’ll need a long, long health bar to survive a hit. When the fight starts the boss will rush at you; roll sideways and don’t stop until the boss finishes this attack. If you stay close to him, you’ll never see it again. If you do, sideways rolling sorts it out. In addition to his ranged attacks, Midir has single melee swipe attacks, and two combos you can exploit. Get close to his face (give him a smack there, if you dare; he takes double damage) or just inside his neck to lure him into performing these combos. Midir’s most common combo is two claw swipes, followed by a flame attack. When he winds up, just roll forward and through him, and get all the way to the end of his tail (any closer, and you’ll be burned). Here you can wail away at him a few times (if you struggle to hit his tail with melee, use lock on and smack him with a single arrow or spell) before quickly dodging out of the way of his tailwhip counter-attack; he doesn’t always use it, but it hits hard, so better safe than sorry. If you’re lucky, Midir will do his other combo, which is a couple of bites follows by breathing fire ahead of him. Instead of moving right to the tail, stay by one of his rear feet and smack away merrily a few times. He won’t tail whip here, so it’s much easier to get into position for the next go-round. In either case, your next goal is to get right back close to his head so you can dodge his next combo and repeat this sequence of events, over and over and over again. When you get Midir to half health he’ll hunker down and start sucking in dark, preparing to do a horrible new AOE attack. You can only run, run, run out of this mess. He may do this again if you take too long to kill him, and if so, just run away again. In this second phase Midir gets more trigger happy with ranged attacks so it’s even more important to stay as close to him as possible. Otherwise, it’s the same old cycle. Defeating Midir awards youSoul of Darkeater Midir, which you can transpose for Frayed Blade or the Old Moonlight spell. Also, you have our most sincere congratulations and admiration.